Israel gives Iran until 2015 to develop nuclear weapons. At least, Israel plans to have its multi-layered missile defense shield up by then, in anticipation that in five years Iran may still be ruled by those who want to wipe Israel off the map. In the meanwhile, Iran is bent on strengthening its own air defense. The Iranian government operates in fear that Israel may use preemptive strikes to nip its nuclear aspirations in the bud. The Iranian military began its "Defenders Of The Sky" drills on Tuesday to practice intercepting enemy planes. The maneuvers will last five days total, using low-, mid-, and high-altitude missiles. The war games have been dubbed Iran's "biggest" and are focused around nuclear sites, no doubt because Iran is worried that Israel may still make strikes to wipe out its nuclear power efforts. After the new round of sanctions were approved in June, Russia gave in to US and Israeli pressure and would not sell Iran its S-300 missile system. The S-300 can detect, track, and destroy a variety of missiles and aircraft. Iran claims it has developed its own version of that system, however, and has said it will soon test it. "The large-scale military maneuvers ... will improve readiness to confront possible threats to Iran's air space and the very populated, vital and nuclear centers," said Ahmad Mighani, head of a defensive Iranian air force unit, on state television. In the meanwhile, Israel has long feared nuclear enemies and has preemptively struck Iraq and Syria in the past to prevent them from going nuclear. The Israeli government figures it will take about five years for Iran to produce a nuclear weapon and has been working on adding another layer to the nation's air defense system. Israel has already developed its Iron Dome protection system to intercept rockets with ranges of 3-45 miles. Israel also has its Arrow interceptor, which can shoot down high altitude ballistic missiles. The Arrow III upgrade, which will shoot down missiles outside Earth's atmosphere through a booster-rigged satellite, is expected to be ready by 2014 or 2015. One of the Arrow III's advantages, according to project director Yoav Turgeman, is that its destroying a nuclear missile would not rain down toxic radioactive debris. All such fallout would burn up as it reenters Earth's atmosphere. 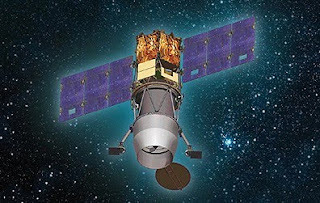 Using both short-range interceptors and kamikaze satellites, Israel hopes to protect itself from nuclear enemies. The revived Jewish nation has survived for more than 60 years, despite being surrounded by those who hate its existence. As its government considers missile defense, many still wait for the day the Messiah will sit on the throne of his father David in Jerusalem. Please continue to pray for the peace of Jerusalem.